Next up was highlights and shadows. The wash does a lot to bring out the details, but a little extra work will really make them pop. 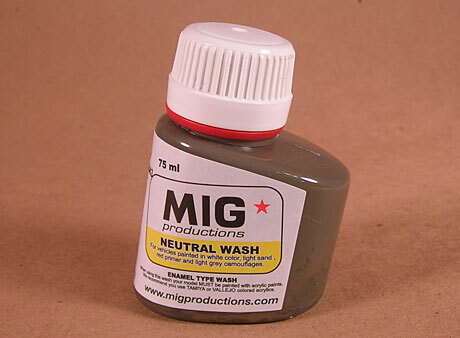 First I used Mig Productions “Wash” to deepen some of the recesses and bring out some details that the first discoloration wash did not. I used their Neutral color and a very thin brush and applied it around some of the deeper areas, panel lines and things I wanted to pop more. After that dried I used a little white oil paint and highlighted some of the raided panels and details by applying very thin coats to those areas. I used some various oils and cleaned-up my rusted panels as well. After some pigments those should look really nice. And that’ll be the final step. Pigments will be applied for scorch marks, engine burn, etc. Migs new Fantasy line has some great colors to really bring the engine nozzels to life and their new metalics (coper, silver, steel) should look great rubbed on some of the conduit and guns. I also need to give the R5 unit a little discoloration as he’s so far just been painted and decaled. 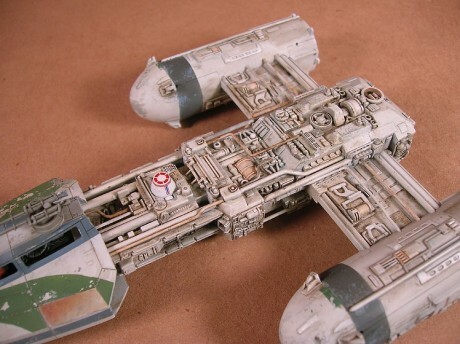 I do want him to look relatively clean compared to the Y-Wing though for some contrast. 1/72 Scale, 502 Abteilung, A New Hope, Custom, Duplicolor Primer, Fine Molds, Green Two, Oil Paint Discoloration, Return of the Jedi, Star Wars, Wash, Weathering, Y-Wing. Bookmark.